Experience cannot be replaced by anything else. Regarding code writing : Expressiveness has been mentionned several times as one of the top-3 keys to quality code. Monday was a big day four Eric Lefevre and myself, as we were animating a coding dojo session on the theme “adding functionality to lecgacy code”. We had planned to ask for a dozen volunteers to participate and take turns coding on our Monopoly example.It turned out we were about ten people in the room, so we didn’t need to ask for volunteers, we had the perfect size crowd for the exercise.We used Test Driven Development (of course!) during the session. This is also a good mean for measuring what we can archieve during one hour of coding, and to have a garantee that we end up with working software. The session went with quite passionnate discusions about what we should do next, the scope of tests, etc. Eventually, one of the major take away from this session was that pair programming is not easy. This is probably even more true in this context were people didn’t know each other before the session, they didn’t know each other way of thinking, coding habits, etc. We did actually run the same exercise with people doing weekly dojo session in Paris and managed to get more functionality implemented, probably because people were a little bit used to coding with each other. 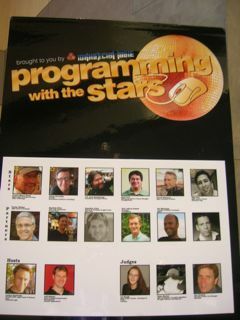 Eric also managed to perform at the “Programing with the stars” contest during lunchtime, where there were fantastic teams, jury and a great presenter, who managed to make this event look like a TV show with suspense, loud music, applause and all. All in all, a pretty good day to begin this conference. I’ll add more about sessions I attended in other articles. This entry was posted on Thursday, August 27th, 2009 at 12:52 am	and is filed under java, valtech, professional, Uncategorized. You can follow any responses to this entry through the RSS 2.0 feed. You can leave a response, or trackback from your own site.